If there were a spoof of the Bee Gees' song, How Can You Mend a Broken Heart, and it involved a broken heel, you'd probably spot "crazy glue" somewhere in the lyrics. That's the quick fix for those days when changing your shoes is just not an option. Keep some powerful glue in your purse for emergencies like this one and your feet will thank you!If your broken heel came detached at the base and nails are visible, coat them with the glue and slide them back into their places. If the heel just snapped, coat one piece with glue at the site of the break and do your best to re-attach them. The long-term answer to a broken heel is to take both shoes to a shoe repair store. They can replace the heel block for you if it's broken, or just re-attach it if it's still in one piece. If a replacement is needed, you'll have to have both shoes in the pair worked on simply because the new heel block is not likely to be a perfect match to the old one. That will vary greatly on the way the heel broke (or it if only detached itself from the upper), the type of shoe you have and the area in which you live. Go to ShoeRepairShops.com to find the nearest stores that can repair your broken heel. You will find the store's phone number on the site, as well. Call ahead to make sure they can do what you need them to. If the shoes were cheap, it's pretty much a no-brainer--toss those things! In some cases, you will find that the shoes that stole your heart were shoes you made out like a bandit on. They were cheap, yes, but they are now irreplaceable. In that case, go ahead and give shoe repair a shot. A broken heel doesn't necessarily mean death for your shoe. If you have a pair of designer shoes and the heel snaps, you'll definitely want to get those looked at by a very good shoe repair specialist. It's less common for designer shoes to have this type of problem anyway, since they're of higher quality than their inexpensive counterparts. If your shoes are new, definitely try to take them back to the store where you bought them for an exchange. If they're defective, the store may allow you to choose a new pair. It never hurts to try it! The moment you feel your heel about to give way, you may not be in the perfect situation to whip out the superglue and repair your broken heel. Shift your weight to your tiptoes, taking the weight off the heel. You'll lessen the probability that you'll fall on your face once the heel finally does finish detaching from the shoe's upper. 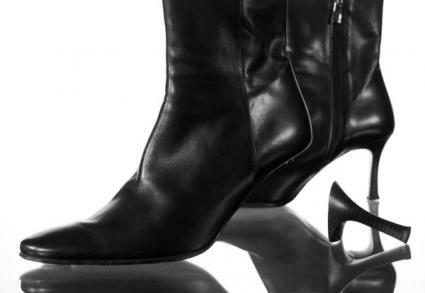 If the heel's going to snap in the middle, you probably won't have much warning. Try to keep your balance if possible, then tiptoe over to a place where you can apply glue and wait for it to dry. Try not to walk much more after that!